Most of the content below is from the Small Wind Guidebook provided by OpenEI which is developed and maintained by the National Renewable Energy Laboratory with funding and support from the U.S. Department of Energy and a network of international partners & sponsors. Bergey 10 kW turbine being installed on a 120′ self-supporting lattice tower for a winery in Lockport, NY. 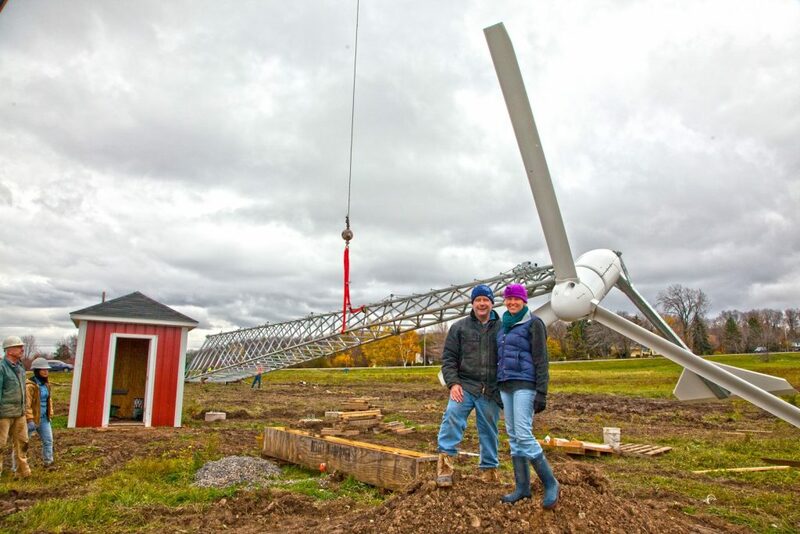 Photo: Niagra Wind & Solar, Inc. Your property has a good wind resource (at least 10 miles per hour (mph) annual average wind speed at tower height). You’re comfortable with long-term investments. Your average electricity bills are $150 per month or more or you don’t have access to utility grid power. 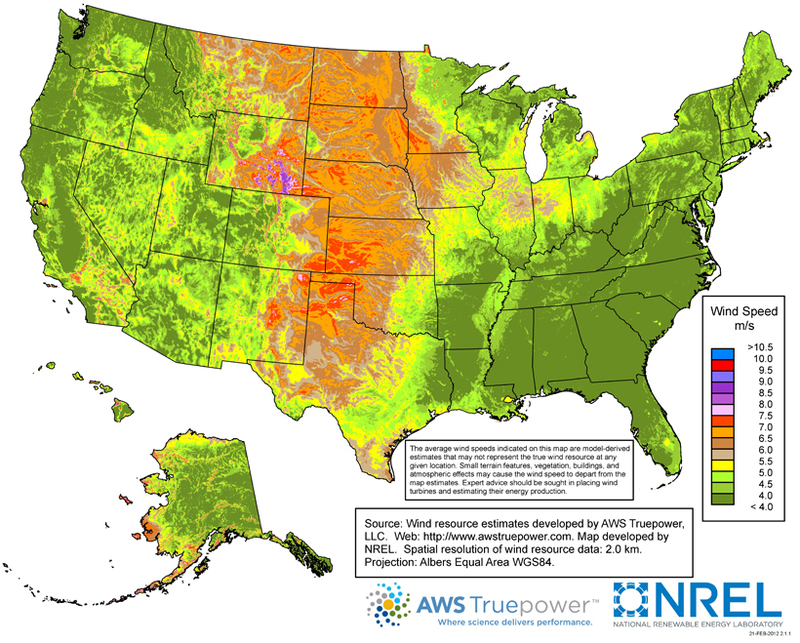 An analysis of behind-the-meter distributed wind potential in the United States found that distributed wind systems are technically feasible for approximately 49.5 million residential, commercial, or industrial sites, or about 44% of all U.S. buildings. This analysis shows that the distributed wind market opportunity is significant, and distributed wind has potential to play an increasing role in the U.S. electricity sector. Distributed wind systems can be one of the most cost-effective on-site renewable energy systems. Wind is an abundant source of clean, renewable, and affordable domestic energy. Depending on your wind resource, a distributed wind energy system can lower your electricity bill slightly or up to 100%, help you avoid the high costs of extending utility power lines to remote locations, and sometimes can provide DC or off-grid power. Off-grid distributed wind systems can provide reliable power for homes, farms, or even entire communities that are far from the nearest utility lines. 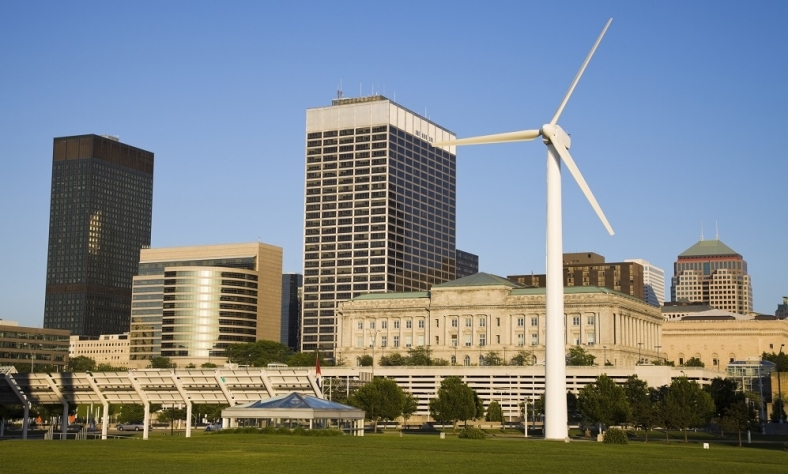 For more information, please see DWEA’s Off-Grid Distributed Wind Systems Resources. Wind is created by the unequal heating of the Earth’s surface by the sun. Wind turbines convert the kinetic energy in wind into mechanical power that runs a generator to produce clean electricity. Today’s turbines are versatile modular sources of electricity. Their blades are aerodynamically designed to capture the maximum energy from the wind. The wind turns the blades, which spin a shaft connected to a generator or the generator’s rotor, which makes electricity. A site with an annual average wind speed of at least 10-12 mph (4.47 – 5.36 meters per second or m/s) at 100 feet (30 meters, which is a standard tower height), is typically considered sufficient for small wind turbines (up to 100 kW). For mid-size (101 kW – 1 MW) and large-scale (greater than 1 MW) turbines, taller towers, typically 50 – 80 meters, and higher annual average wind speeds are required. The U.S. Department of Energy WINDExchange Initiative has 30, 50, and 80 meter wind resource maps for each state available on their website. The size of the wind turbine you need depends on your application. Small turbines range in size from 20 Watts to 100 kilowatts (kW). The smaller or “micro” (20- to 500-Watt) turbines are used in applications such as charging batteries for recreational vehicles and sailboats. Turbines used in residential applications can range in size from 400 Watts to 100 kW, depending on the amount of electricity you want to generate. Mid-size (101 kW – 1 MW) and large-scale (greater than 1 MW) turbines are used in commercial and community applications. Wind turbine manufacturers, dealers, and installers can help you size your system based on your electricity needs and the specifics of your local wind resource and micro-siting. They can provide you with the expected annual energy output of the turbine as a function of annual average wind speed. This information along with information about any available financial incentives will help determine the appropriate size of turbine. To justify your investment in a small wind turbine, you will want assurances that your turbine model has been evaluated for safety, performance, and functionality. For more information, please see DWEA’s Certification Resources. Installation costs vary greatly depending on local zoning, permitting, and utility interconnection costs. Depending on these considerations, as well as the turbine size, distributed wind energy systems have an average cost of approximately $5,760 per kilowatt installed. It should be noted that larger projects are commonly associated with lower costs per kilowatt. The capacity-weighted average installed project cost for 2015 projects less than or equal to 5 megawatts (MW) was approximately $3,412/kW, while projects between 5 and 20 MW averaged approximately $1,931/kW. For a list of active U.S. distributed wind installers, please see the Distributed Wind Installers List on OpenEI. Distributed wind systems can be connected to the electricity distribution system. A grid-connected wind turbine can reduce your consumption of utility-supplied electricity for lighting, appliances, and electric heat. If the turbine cannot deliver the amount of energy you need, the utility makes up the difference. When the wind system produces more electricity than the household requires, the excess is sent or sold to the utility. These arrangements with the utility company are typically called net metering or net billing, and they address the value of the electricity sold or net excess generation, the time period for valuing the electricity (typically annually or monthly), and any other contractual requirements with the utility. The Database of State Incentives for Renewables & Efficiency (DSIRE) offers a database of available Federal, state, and utility incentives and policies (e.g., rebates, tax credits, grants, net metering, production-based incentives, and loans) for distributed wind projects. Zoning refers to the general local regulations that allow and restrict various types of projects, whereas permitting refers to acquiring permits for a specific project within the scope of those zoning rules. The zoning and permitting processes for wind energy installations seek to address safety, aesthetics, and community interests and concerns. Some of these concerns might include sound level, visual impact, wildlife impact, TV/radio interference, ice shedding, or broken equipment. Practices vary dramatically across the country so becoming familiar with the local regulations, authorities, and general requirements is helpful. For more information, please see DWEA’s Permitting and Zoning Resource Center.